It seems like it would take extra labor to have a barista manning the separate drip-only register. I would love to know if the express line test stores have been given extra labor for this test. I recall hearing that Starbucks was also conducting such a test at one isolated store in Washington D.C. but I don’t even remember where I heard this gossip. If any of my readers have been to a Starbucks with a “drip only” line, please do tell how it worked! Did you like it? I would love to hear all your thoughts on this idea! Please keep your iced tea! Right now, in Atlanta, (and perhaps all of Georgia), Starbucks is testing a “Classic” black tea. The new black tea is a different recipe than what is currently offered at Starbucks. The new “Classic” black tea is still made by Tazo, however it lacks the citrus and bergamot flavors which give the current black tea its unique complex flavor. It’s a much more classic, plain black tea, for the palate that wants just a basic tea, and perhaps even in a Trenta cup. 😉 The new black tea, so I hear, is offered at a slightly lower price point than the non-test black tea, though I do not know the price of it. This test is currently in progress through the end of September, and designed as a summer test, when customers want a larger refreshing tea beverage while it’s hot outside. As can be seen in the MyStarbucksIdea threads, the stores that have the “Classic” black tea are usually offering the Trenta size cup also. I can see why this new tea might appeal to some people, however, I hate to say this, but I hope this new black tea does not make its way to Seattle. I like the black tea exactly as it is now. Has anyone here tried this new tea? 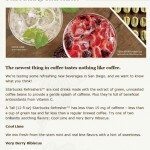 Unlike most Starbucks tests, the “Refreshers” beverage test was widely-announced by Starbucks. Usually testing of new food and beverage innovations is done quietly and without fanfare. 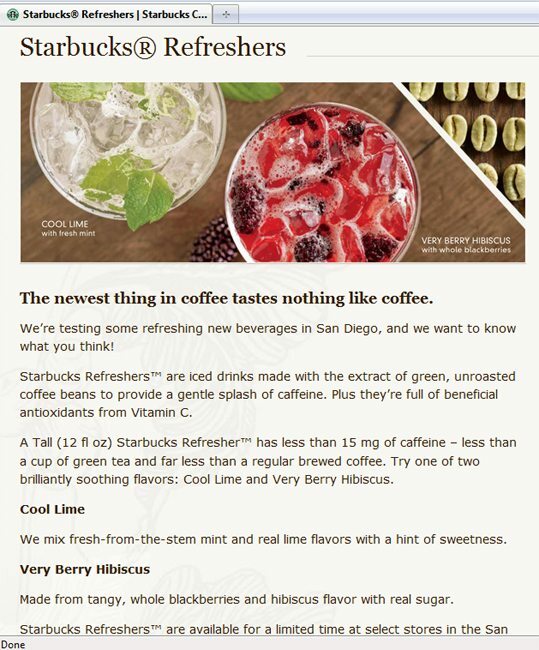 There is even a website for the “Refreshers”: http://www.starbucks.com/refreshers. At this point I don’t have too much to say about these drinks. I’m hoping to try them later on this month and then I’ll report back here with a full report. The Refreshers are available in two flavors: Cool Lime and Very Berry Hibiscus. They are iced drinks made with green, unroasted coffee beans. Just as an aside, if anyone reading this knows the San Diego area well, I am looking for store suggestions. I’d like to be able to write a review of the refreshers, and possibly review a nice store with a great design and a friendly staff of partners. I can randomly pick a Starbucks in San Diego county to go try these drinks, but I’d much rather have a few suggestions to work with! Thanks in advance for your help! That is quite a roundup of three tests! I’d love to hear your thoughts and if you have encountered any of these test items! If you like reading about test items, I have a complete category of them here (some of those tests may include old test products never launched). Could Teavana Replace Tazo Tea Inside Starbucks Stores? From the StarbucksMelody mailbag: Sweet tea in North Carolina. A Clover in Folsom and Sea Girt. The Copacabana Beach Frappuccino: A Single Store Test. Wow Melody what a great post! Didn’t realize that there were so many tests going on at different SB stores. We never get any tests here. Re the black tea test- as you know I drink the green tea iced and love it. Have had the black tea on occasion and like it. Why would they change it? Re the drip line- the lines vary so much at the SB I frequent most often so doing drip only probably would not make a difference. And the store itself is not that big so having two different lines would cause a huge problem. Re San Diego- when we were there we went to one SB and it was nice but can’t remember which location it was. We don’t have the refresher drinks here yet. I would like to know exactly where downtown (Chicago) this coffee-line only store is. CD should be able to say? I think he mentioned it. I assume it’s in the loop. what streets? As for the ‘refreshers’, they have always sounded good when someone has written about them but again, I think I would rather see Sbux stay more toward COFFEE. I really can’t imagine (and neither can the baristas that I’ve talked to about it, some had no idea of it) how they’re going to do the new ‘flavored VIA’ when it comes out. It’s just too much. It’s too many messages being put out by Sbux: buy our coffee (small message) AND buy this and make it yourself……soon to be in 8 options (VIA)! I realize we brew our own coffee when we buy their beans and take them home BUT that option, the # of choices, seems to diminish as the VIA grows. Thinking about it I find it interesting how much SB is expanding their drinks and products. I agree perhaps they need to go back to basics – tea and coffee. Perhaps they are adding too many things too fast? What is their basic objective? To gain more customers or increase their bottom line or are both the same? But, in the end will they lose more customers than gain customers? BTW are they still opening new stores? I think it’s an interesting test. Drip only express line. Are there much drip coffee consumers in the area? Next test is “self-drip and self-payment only express line” ? Haha. Seriously, Starbucks does cater to different types of customers and they do need to test out different ways to reach/serve them. “One size fits all” doesn’t. What I wish the SSC (and district/regional managers) would understand is that in no way am I a VIA candidate. Or a pumpkin spice candidate. I know what I want and I know what I do not want. I do not want to be “sold” on the latest instant coffee or the latest promotional beverage. I’m an informed consumer. If something new catches my eye, and I am truly interested, I’ll try it. But I do not need an uninformed barista persistently pushing something on me if they have not even attempted to understand MY needs. Starbucks has seemed to have forgotten about “Connect, Discover, Respond” with all of this suggestive selling. Connect with me. Discover things about me. Do I camp? Do I ever brew coffee? Have I ever found myself in a coffee emergency where I could not find great coffee? Does VIA give me gastrointestinal problems? Seriously, make an attempt to connect and discover something about your customers instead of pushing a “do you want fries with that”-type of lame sales pitch. Believe me when I say, if the world was ending and I couldn’t have an espresso or a cup of freshly brewed bold, I’d seriously eat espresso beans before I drank VIA. The problem with Starbucks’ recent pushes into “suggestive selling” is that they have destroyed their hard-earned/protected values in order to make their goals. Soulless suggestion at any cost is not Welcoming, Genuine, Knowledgeable, Considerate or Involved. I love Starbucks. I love their whole beans, bold drip and simpler espresso drinks (double short cappuccino, doppio machiatto, etc.). When it comes to Starbucks, I know what I want and I am willing to pay the Starbucks premium to get it. I respect that many like Pumpkin Spice, VIA and Pike Place Roast. None of those are for me, but I appreciate that Starbucks has found a market for those items. I’m simply asking the respect be mutual. Ah, Melody! You should have posted the Refreshers thing a month or two ago, when I was in San Diego! I have lived in San Diego for several years, but I now live in Long Beach (to the north a bit). I knew tons of people who went to Starbucks almost daily, haha. I like the black tea as is, too. (Its also pretty good with a pump or two of vanilla!) A while ago the South had a “Southern Sweet Tea” which we put 16 oz of pure cane sugar in the tea pitchers. I bet my store has customers that would like the “Drip Only” line, but I appreciate that you understand that would be difficult from the baristas stand point, too. Not impossible, but it would take some extra time to plan it out right. I can see the two lines working in large-market shops – I’m a drip-only customer and would appreciate the time savings some mornings, but my usual shops aren’t so busy when I’m there that it would make any difference. As for the black tea test in Atlanta – keep in mind that they have a SERIOUS tea market battle in that region that they just aren’t facing elsewhere. I doubt it would go nationwide even if deemed successful. Sounds as if they’re trying to divert some of the Lipton bagged tea drinkers. As far as I know the Classic Iced Tea test is Georgia-wide, or at least both Atlanta and Savannah markets. I definitely like the old Iced Black Tea more than the new Classic Iced Tea — it tastes like an attempt at a Lipton-style iced tea. Also, this test plus the Trenta (re)test are being called the “Iced Refreshment” test (the same nomenclature we used for Summer Phase 2). Just FYI, since you’re as much of an aficionado for product knowledge as I am! @CD-I think you hit the nail on the head. Just today on my break I noticed we have a box of each of the flavored VIA’s in the back labeled “For Managers to Open ONLY” or something to that effect… We’ll have to see how they go over. I’m not sure they will have a place. Ah yes, the wonderful days of the bean and beverage lines…, wonderful because of the aroma from the beans, not so wonderful with the people who got in the shorter bean line (and there were frequently one or two compared to five plus in the beverage line) and were nicely told that this was the bean line…, insert your own visions of confrontation here. 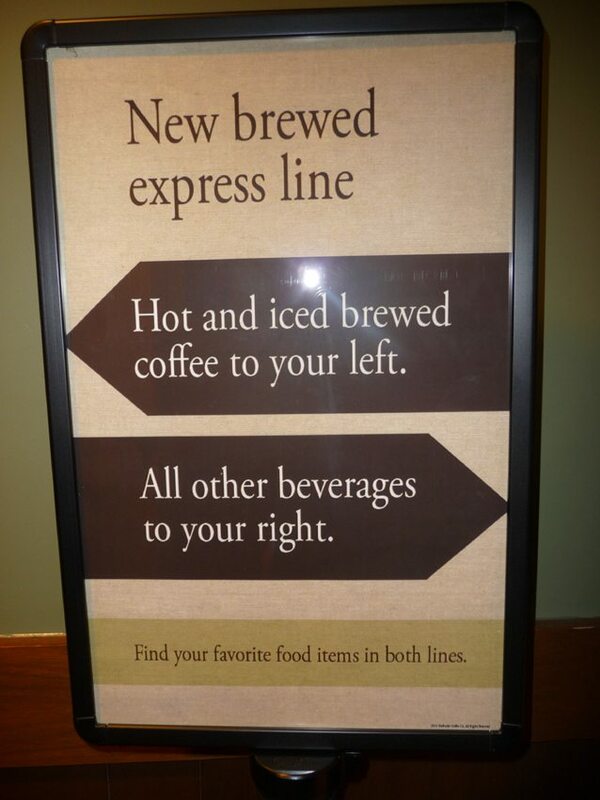 Yes, if you wanted beans and a beverage, no problem; trying to cut the beverage line, problem. Unfortunately, way too many people/customers do not read and do not accept direction (would be easier to herd cats 😉 ). Ever notice how many businesses have a single serpentine line that feeds all positions. Cate makes a good point in her TwitVid regarding the “expediter”, Starbucks has not quite figured out how to train to make this position work. I have seen a few Starbucks Managers who have and have employees who actually grasp the expediter (and team) concept and it works–poetry in motion–happy customers–happy employees. However, it requires that all members of the team work together and all too often someone is having an attitude and you can see the flow crumble and the people grumble. 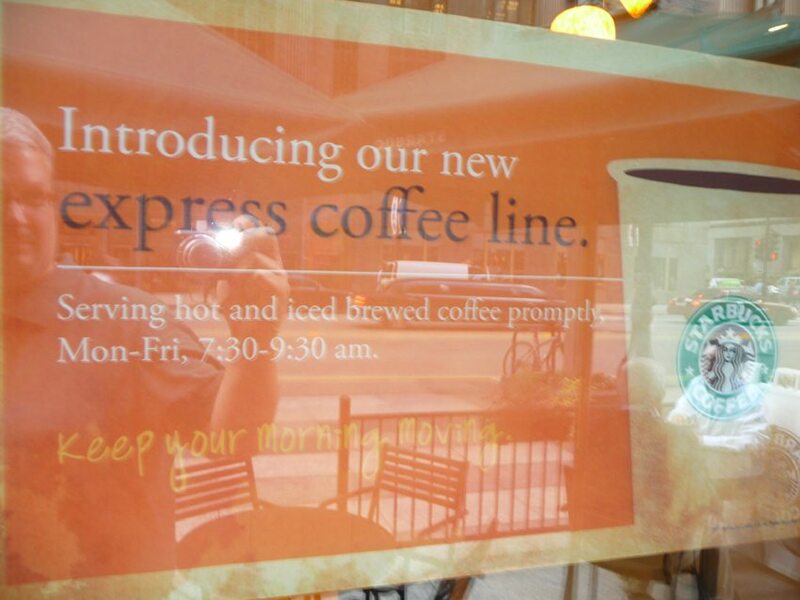 I forget who mentioned, or asked this, but I can tell you that I am fairly positive (considering the location of the Chicago x-press lines store) that they would be selling alot of drip coffee. Busy professional business people. right at City Hall, court, etc. @CateTV – I love the idea of having a barista use one of those portable card-swipe payment systems and then the barista could be processing transactions for people standing in line. I wonder if Starbucks could make a portable card-swipe thingy just for their cards. It almost seems like if all the ideas you suggested were implemented, maybe there would be no need for a drip only line. I have seen expediters calling drinks. 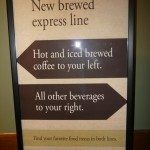 Though I prefer a leisurely experience, and once in a while, having a person ask me my drink when I’m deep in the line makes me feel a little rushed. I understand though that’s the way it’s gotta be. @CD – That is a perfect comment. Find out what the customer needs. Connect. Pushing Via like a used carsalesman is the opposite of connecting. 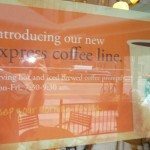 I remember that up until about 10-11 years ago, in Southern California, Starbucks had a drip only line during the morning rush. It was usually the same as the whole bean line, but very few whole bean customers at that time. Starbucks got rid of it saying that it was not “Fair” that customers in drip would be out in a couple minutes, while those in the espresso line would be waiting much longer, with common times of 10-15 minutes or longer in the morning rush. Because of the long wait times for those customers, they noticed that some customers would “just settle” for drip, when they really wanted a mocha, etc. So, the “drip only” line went away. With increased speeds (target around 3 min), and better efficiency, I wonder if the “drip only” line will work to improve service with speed in stores. If you have a drip only line, you could serve coffee out in the parking lot and swipe cards with a portable device – like the people taking orders in the parking lots of In-N-Out. You can have a barista wearing a backpack urn filling up drip. I have to put in my two cents and ask that Starbucks please consider including a nice bold drip — Verona!!! Like “CD,” I do appreciate that many customers must like Pike Place, but around here (SoCal) that’s usually all you’ll find. That’s why I rarely go anymore there for drip. If I’m in the mood for a latte or mocha (has to be cool weather for that), I’ll stop in, of course. But I’d stop in a whole lot more often if I knew they would have a better variety of drip. I can’t wait for Flavored Via to launch in early October. I’ll be stuffing it down people’s throats. Let’s hope I don’t get my grubby mitts on a trenta coffee rather than tea! I’m not a fan of a drip only line for most of the reasons already stated. @CateTV Over here in Australia, it’s actually quite common to see an expediter, out on the line deployed. Orders are taken onto a sleeve/cup by the expediter and queued. Even in the greatest peak periods, waiting on an espresso beverage will only take 5-7mins max. It’s a well practiced system that runs like clockwork! If you’re coming to San Diego, try the store on Adams Street in the Kensington neighborhood. It’s a charming part of town, hidden up a hillside away from the usual commercial bustle. It’s one of the nicest looking stores I’ve been in, with realist oil paintings by a local artist featured on the walls! Makes my morning bold brew feel pretty sophisticated. It’s also one of only two Starbucks Reserve stores in the area. I can’t see this every really really working…like someone has said, people don’t pay attention! I don’t want to be rude, but everyday I call out a very different drink and someone will look right at me as a say it, then ask if it’s their drink…I can’t imagine what this lack of attention would lead to for baristas in this type of situation! ick! Hey Melody! Never commented before, but I just wanted to tell you that I’m positively addicted to your blog. I’m a partner from Florida, and I’ve shown your website to so many people at work and they all feel the same as I do about it/you! Keep it up 🙂 Thanks for providing us with Starbucks-awesomeness! As far as the black tea goes, we’ve actually had customers who ask if we have plain black tea, because they’ve described the one we have now as too tangy and citrusy. Never thought about it myself, as I’m a green tea girl. The drip-only lines make sense. I feel horrible when a customer ordering a tall Pike has to wait behind customers ordering six drinks, or kids who can’t decide on a frappuccino!! @CD – SO TRUE. It’s getting ridiculous already, and now flavored via? Where is there going to be room for that! Hi Dee! Welcome to the little blog here! I wonder if these desire for a plain tea is a regional thing. I’ve never heard of anything like that here in Seattle – Honestly nobody asks for plain tea here. I LOVE the black tea, no water, with Orange Mango juice instead of Lemonade. That is so refreshing. Baristas can never really decide how to charge it but I don’t care – The orange mango goes perfectly with the bit of citrus in the black tea! I would be upset if classic tea test comes to Seattle. Thanks for coming on here and joining in the comments! I hope you’ll be back! I am in Atlanta and I HATE the new classic tea. If I wanted “regular” tea I would go to McDonalds where it is actually better and cheaper. I am a gold member and only go to Starbucks for the AWAKE original and I will not go back until they change back. PLEASE help !!!!!! re the tea: I can’t see it selling well for one simple reason, you can get really good sweet tea for really cheap in the south. No one is going to want to pay what starbucks charges for tea. It would be silly. They should stick to what they do well. I lived in the south for a while (and still make myself sweet tea mmmm) and it’s just a natural part of the culture…everyone knows how to make it and again, you can get it everywhere. You are so right…….several of us actually found out about the awake tea at another local restaurant that we frequent. We loved it so much and asked what kind and they said “same as Starbucks” Before that since we were not coffee drinkers we had not even gone to Starbucks and after that became GOLD members……all because of their tea. Also we can now purchase the awake tea in the grocery so if all else fails I can make my own and take it to Starbucks for the atmosphere…..